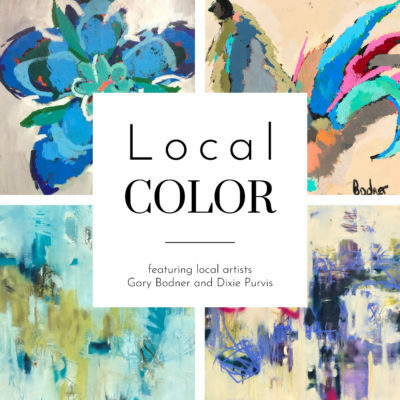 Just in time for Spring, Anne Irwin Fine Art proudly presents the bright and colorful works of Dixie Purvis and Gary Bodner in their respective signature styles at the upcoming show, Local Color. Come enjoy the Opening Reception where you’ll explore these vibrant paintings, meet the artists, and enjoy cocktails and lite bites! Dixie Purvis is an abstract painter who has been previously featured in the gallery’s Women and Art Show, showcasing oil on panel. Gary Bodner’s own Solo Show at the Gallery featured his fun, fresh use of color in an expressionistic approach. More information on current exhibitions at Anne Irwin Fine Art.